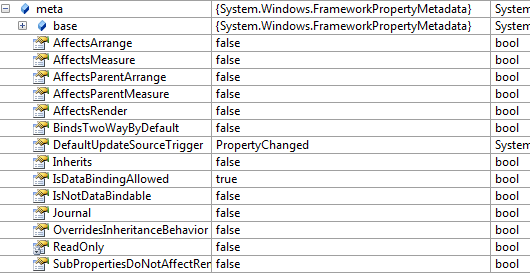 Some dependency properties in WPF have metadata deriving from UIPropertyMetadata or FrameworkPropertyMetadata, rather than from PropertyMetadata. For example, the ComboBox.IsEnabledProperty, which is defined in UIElement has metadata of type UIPropertyMetadata. UIPropertyMetadata derives from PropertyMetadata and adds the IsAnimationProhibited property. The Button.IsEnabledProperty has metadata of type FrameworkPropertyMetadata. FrameworkPropertyMetadata derives from UIPropertyMetadata and adds properties related to layout.